How many Units (3 pack)? The Aulterra Neutralizer alters, both the properties of the EMF wave from mobile phones, and its impact on DNA. 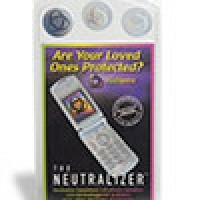 The Neutralizer emits a naturally occurring (from rock minerals and crystalline matrices, ground and activated) Tachyon Field. Think of the mess a child makes when playing with toys, books, crayons etc. You could say that the mess was "disorder". Imagine, therefore your cells (which contain DNA), after exposure to mobile phone EMF's, also being messy, ie. in a state of disorder. As you would expect, they wouldn't be too healthy. It's the same with an incoherent EMF wave from a mobile phone it is messy, or fuzzy. These states of disorder are an example of positive entropy, according to science. When you tidy the child's mess, you create order. When your cell (DNA) is tidied (made healthy), you create order. When an EMF wave is made coherent (tidied), you create order. These states follow the direction of negative entropy. When you create a Tachyon Field then things move towards negative entropy, ie. Order is created mess is tidied, cells (DNA) get healthier, and EMF waves from mobile phones become coherent and harmless. Tachyons are particles that travel faster than the speed of light and were predicted by Albert Einstein. Indeed there is a model known as the Tiller-Einstein model, (named after Einstein and professor William A. Tiller at Stanford University USA) which predicts their behavior. Tachyons cause a shift towards negative entropy (or negentropy as its sometimes called), which means that anything in the tachyon field moves into a state of order (tidied up). Until recent developments in Quantum Physics, these observations would have sounded impossible, however, it is now established science, as the following list shows. In India, the government is entertaining the implementation of a Tachyon system to energize all the bottled drinking water distributed throughout the country. In Germany, the government is evaluating an organic farming project that utilizes tachyonised materials to maintain the strength and balance of the individual plants. In Japan, they use tachyon silica discs to combat the electromagnetic field problems of computer screens. We use the Aulterra Neutralizer on our screens. In the USA, medical doctors have been on TV reporting the effects of tachyon materials. In Holland, a pharmaceutical company has received national approval to import Tachyonised organ-specific products to be distributed to the medical profession. The Tachyon Field is also referred to by a few other names, e.g. Quantum Field and Zero Point Energy, or Free Energy. Another way to look at this (less scientific) is that the neutralizer produces a "subtle" energy field (or prana, as they call it in India) - much the same as crystals do. Indeed, Aulterra is a homeopathically activated mixture of ground crystals. It is all the same energy. Conventional instruments cannot detect tachyons, because conventional instruments rely on the movement of electrons along wires. Tachyons are not electrons so it is impossible to detect them in this way. They can, however, be detected by biological systems by watching the biological systems move into a state of order Aulterra's independent testing studied the behaviour of DNA in the presence of Aulterra. This is actually an excellent test, because a biological system will more accurately represent the effect of mobile phone radiation, than a direct measurement of the levels of EMF's emitted from the phone. The Aulterra neutralizer has been shown to completely neutralize the damaging effect of mobile phone radiation on human DNA. This effect can easily be explained as the consequence of Aulterra emitting a Tachyon Field.